In 1987 a memorial garden was established on the grounds of St Michael’s, this garden has recently been replanted making it a quiet and beautiful place for reflection and thanksgiving. 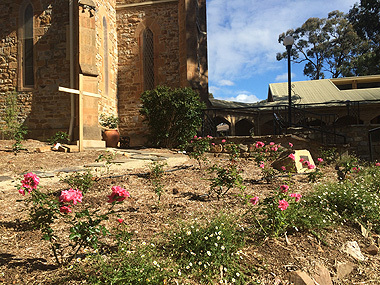 The Garden of Remembrance is identified by a cross of Huon Pine and planted with roses. The Bishop having consecrated the whole of the ground, means that ashes are reverently interred, throughout the garden but not at set intervals, nor is any particular spot. A Memorial Register containing the names of all those whose ashes are interred in the Garden is kept in the narthex of the church and they are remembered at worship as their anniversary of death comes round each year. A memorial plaque may be ordered through the parish and placed on the pavement by the church wall adjoining the garden. The plaque will show the name, dates of birth and death of the deceased. The charge for these plaques will include an amount to be used, as the Bishop has decreed, for the upkeep and maintenance of the garden.